The top of the oven is raised (+7.5cm) in order to make it easier to place big pieces of meat or big dishes. It is ideal for baking wild game and making stews in potteries from the Alsace region. 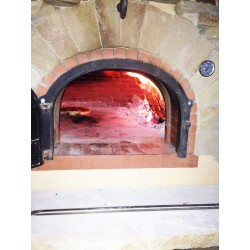 The all-in-one oven includes : oven, cast iron door, refractory insulating door, 180 mm diameter flue connector with a damper, complete insulation and vault thermometer .